The latest mass shooting in America that has claimed the lives of high school students is rekindling debate over the nation's gun control laws, a hodge-podge of federal and state statutes that regulate who can legally own guns and where. After 19-year-old Nikolas Cruz allegedly killed of 17 people Wednesday at Marjory Stoneman Douglas High School in Parkland, Florida - the third most deadly school shooting in American history - Broward County School District Superintendent Robert Runcie summed up the sentiments of students and teachers. "Now is the time for this country to have a real conversation about sensible gun control in this country," Runcie said. According to the supreme law of the land regulating gun ownership, the U.S. Constitution's Second Amendment, "A well regulated Militia, being necessary to the security of a free state, the right of the people to keep and bear Arms, shall not be infringed." While federal law has established minimum standards for gun regulation in the U.S., individual states have their own laws, some of which are more restrictive and others more lenient. In Florida, where the shooting occurred, there is no requirement for a person to obtain a license or a permit to own a gun. Floridians can also carry a concealed rifle or shotgun without a permit, although a permit is required to carry a handgun. With Florida's "stand your ground law," which allows defendants to use force without retreating, a gun control advocacy group, the Giffords Law Center, gave the state an "F" grade for its gun laws in 2016. On the federal level, the Gun Control Act of 1968, for example, banned the sale of firearms to certain individuals including those under 18 years old, people with criminal records, dishonorably discharged military veterans and the mentally disabled. The act was amended in 1993 by the Brady Handgun Violence Prevention Act, which prohibited a federally licensed dealer from selling firearms to fugitives and required background checks for unlicensed people buying a gun from those dealers. Former U.S. president Barack Obama's administration approved a rule that added Social Security recipients with mental illnesses and those declared unfit to handle their personal finances to the Federal Bureau of Investigation's National Instant Criminal Background Check System (NICS). After the National Rifle Association and the American Civil Liberties Union complained the law violated the rights of mentally ill without due process, Congress overturned the rule. U.S. President Donald Trump quietly signed it into law in February 2017. Also in February 2017, the Trump administration purged about 500,000 people who were previously considered fugitives from the federal background check system, saying the restriction only applied to fugitives who have crossed state lines to avoid prosecution. Students gather during a vigil at Pine Trails Park for the victims of the Wednesday shooting at Marjory Stoneman Douglas High School, in Parkland, Fla., Feb. 15, 2018. Just days before the February 14 shooting, Trump unveiled his fiscal year 2019 budget, which proposes 16-percent cuts to two programs that provide states with federal funds to improve reporting to NICS: the National Instant Criminal Background Check System and the NICS Act Record Improvement Program. The nation's gun laws are shaped largely by the country's deep-pocketed gun lobby, particularly the National Rifle Association. The NRA and its affiliates spent more than $50 million in political advertisements in the 2016 general election. Most of the money was spent to boost the prospects of Republican candidates in exchange for their support and to oppose Democrats who propose tougher gun laws. The NRA spent more than twice as much to oppose Democrats ($34.5 million) as it did to support Republicans ($14.5 million), according to the Center for Responsive Politics. Donald Trump was the biggest Republican beneficiary of the NRA's ad campaign, which spent $11.4 million on the Trump campaign. Obama suggested on Twitter that voters ultimately have the power to prevent gun violence. 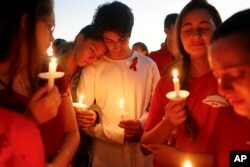 "We are grieving with Parkland. But we are not powerless. Caring for our kids is our first job. And until we can honestly say that we're doing enough to keep them safe from harm, including long overdue, common sense gun safety laws that most Americans want, then we have to change."